application performance or load testing activity. 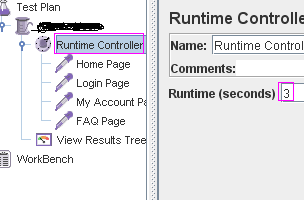 Runtime Controller's function is same as its name. 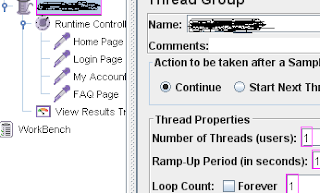 You can set time in Runtime Controller to stop jmeter requests execution after defined time. Let we take one example to get better understanding. Supposing i want to perform load testing on 4 page requests using Runtime Controller. My Jmeter test design will be as shown in bellow images. Look at above images. I set Runtime (Seconds) = 3 in Runtime controller and i am running test. View Result in tree listener shows me only 2 executed requests on completion of execution as bellow image. Now i am increasing Runtime (Seconds) = 15 in Runtime controller then View Result in tree listener shows me more executed requests as bellow. As per above 2 example results, runtime controller will execute requests till definer runtime in Runtime controller without considering loop count of thread group. I think now Runtime controller's function is clear for you. Design and run same test case on your own software application to get better idea.